Edinburgh Capitals today announced the signing of Canadian forward Craig McCallum, who becomes the clubs 13th and final import ahead of the new ice hockey next month. The 26-year-old winger arrives in Edinburgh after five years playing in Canada with the University of Saskatchewan and becomes the fourth player this summer to sign for the club straight out of the North American college market, joining defenceman Nate Flemming and forwards Taylor Dickin and Trevor Gerling. However, despite a lack of professional experience, team co-owner Scott Neil believes McCallum has the raw talent to be a real game changer for the Caps. Meanwhile, Edinburgh have announced three pre-season fixtures. 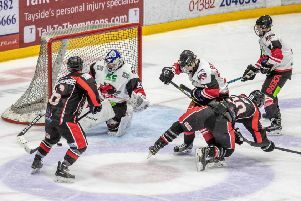 A home and away challenge series with Dundee Stars is on August 26 and 29 before Fife Flyers visit Murrayfield the following night on August 30.